Hot on the heels of my previous Midgard CMS tutorial, "Creating custom navigation with MidCOM, here is a new one about adding categories to a Midgard-powered blog. I've written this in response to Robert Guerra's questions. Midgard CMS contains a powerful PHP-level data abstraction layer called datamanager. With datamanager it is possible to freely modify the content fields and editing widgets used with any component. While I would use more descriptive keys than cat1 for the categories, the actual field definition looks correct. What you need to do next is to copy the default de.linkm.newsticker schema from the component API reference and add your own field definition there. Copy that area into a text editor (or just your clip board), and add the category block you've made into the "fields" array. A good place to do that would be between "title" and "abstract". Then you need to store this new schema definition into your Midgard setup as a snippet. 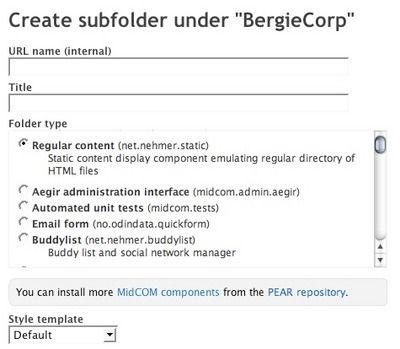 Go to Aegir, select the "Snippet" tab from the left, and create a snippet directory named "sitegroup-config". Then under that create another snippet directory named "de.linkm.newsticker" by clicking "New" on the right-hand frame's menu. This is the default location used for MidCOM's configuration. You don't need to follow that convention but I'd recommend it. Now that you have the snippetdirs created, click "New" (again in the right-hand frame), and create a snippet named "schema-blog", and paste your schema array there. Then you need to configure your newsticker to use the new schema. Here you have two options, either set it to be used by all "newsticker" folders on your site, or only your blog. Note: the steps needed for adding simple category support to your blog might sounds exceedingly difficult. However, it has to be kept in mind that you can use the exactly same technique for controlling all data structures on your site (adding new content fields to articles, photos or whatever). There is more information about modifying schemas in MidCOM schema documentation.